It has magically come to my attention that I haven’t been posting much lately. It’s not easy to maintain a travel blog when you’re office-bound – not as easy, at least. The adventures are no longer fresh in your memory, distorted by time, space, jet lag. The longer it’s been since I’ve traveled, the harder it is to write, especially since there are no grand adventures in the works in the near future. In fact, Chiquita isn’t even sitting on my desk these days; she’s preparing for her adventure to Bangladesh, but she’s leaving me behind. I could write about work. I’m working really hard, and things are progressing well. The people I was training earlier this winter are now able to stand on their own two feet, and it’s rewarding to watch them go about their job, knowing that they are independent now because I did a good job. I could write about how someone ate my yogurt from the fridge last week. Spring has arrived in Montreal, and it is glorious. The restaurant downstairs opened their terrace this weekend for the first time in 2010. We opened up the windows to let in fresh air, dragged the bike into the repair shop to fix the flat tire and put on new breaks, and hung our laundry on the line for the first time this year. These are the reasons why we survive Montreal’s winters, year in and year out. There is also a ton of dog crap everywhere, but somehow I can see past it. I feel like I’m 20 lbs lighter, and in a way I am – I have abandoned my heavy coat, toque, scarf, and boots, tentatively putting them away until next year. It’s that glorious period, 10 days of grace before my allergies kick in and leave me sneezing until late September. 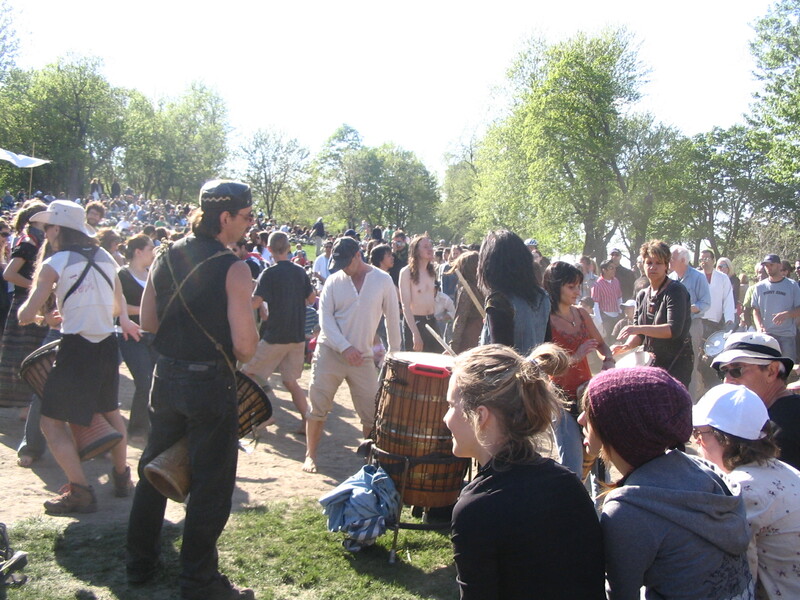 And it means that the Tam Tams will be starting up again soon on Mont-Royal. Actually, I spoke to soon. My allergies have already decided to kick in. ATCHOO!